As luck goes, the British Talent Cup hasn’t had an awful lot so far this season – with Race 2 at Silverstone cancelled due to the track conditions; seeing the same fate as Race 2 of the season opener at Donington. Two races fewer makes it more of an uphill challenge for those who have fallen victim to mistakes and bad luck, with less time to catch Thomas Strudwick and Rory Skinner at the top, but there’s plenty left to race in 2018. Strudwick is the man in the lead, with the Englishman on 114 points after taking a podium in every race. His closest challenger is Skinner, just four off with 110, but the Scot has had a few more inconsistencies. 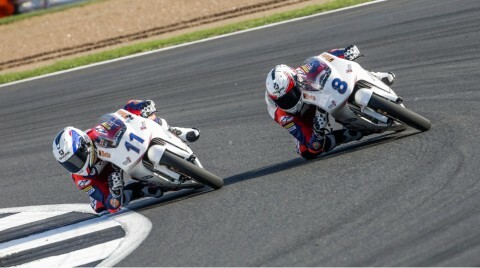 Those inconsistencies didn’t show at Silverstone, however – with Skinner taking another incredibly impressive win. Now, at Assen, will he and Max Cook – currently third on 85 points – be able to move in on Strudwick? The TT Circuit Assen is fast and full of history, one of the longest-serving and most popular in Europe. 12 right and six left-handers over the 4.5km track make it an awesome ride on two wheels, and it has one of the most iconic corners in the world: the Geert Timmer chicane. The final right-left flick before the finish line, it can make or break a race for many and has hosted some incredible drama throughout the years. So will there be more for the BTC? Alongside the British Superbike Championship, the British Talent Cup will be on full attack at the Dutch classic as the countdown to the season finale continues – with only one round left after Assen. Tune in on Saturday at 14:00 (GMT +2) for Race 1, before Race 2 at 11:40 on Sunday.